s] [but instead,] [through] he. the torso [outer court]. of [=for]. he.existence (matrix). [by] the hand of the serpent-hand (tch-t’). c] [and by?] the four inside the hand of he-eden [oil-bowls] (ft’nu+). [of] this (pu). [an-] face (eden’s). 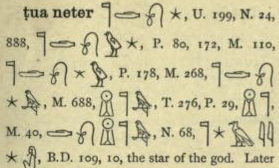 2) "star gates to make the solarplane" SB+, as jackal, also as ÁAT'+star ? 2) ÁAT'+star, not listed as such but occasionally here in CT; "the star / of,as the new-hand / for vulture-rule / of hail", as just another name ? the ÁAT-regions into ÁA-T', then inversed as T'-UA ?